Located less than an hour away from Miami by plane, the Bahamas are the perfect place to unwind and have fun. There are more than 700 islands that comprise the Bahamas archipelago and they offer no shortage of interesting attractions and dramatic adventures. Whether you’re interested in snorkeling, surfing, wreck diving, exploring shipwrecks, fishing or anything in between, the Bahamas will cater to your desires. With nearly year-round perfect weather, pristine beaches, some of the world’s best resorts and easy accessibility from the U.S., a trip to the Bahamas will make for an unforgettable summer vacation. The first inhabitants of the Bahamas, the Lucayans, arrived from Cuba as early as the 4th or 5th century B.C.E. The Bahamas became the first link between Europe and the New World when Christopher Columbus is thought to have landed at San Salvador Island in 1492. Despite Columbus’ positive impression of the Lucayans who he called “sweet and gentle,” the Spanish forcibly relocated them to other Bahamian islands, where they were forced to mine for gold. The Spanish lost interest in the Bahamas after no gold was found, and the Lucayans were essentially wiped out only 25 years after Columbus’ arrival, due to disease. In 1649, a group of English Puritans known as the Eleutheran Adventurers made landfall in the Bahamas in search of religious freedom. This they found, but they faced severe food shortage. The leader of the group, Captain William Sayles, made his way to the Massachussetts Bay Colony where he found desperately needed provisions and it was then smooth sailing for the fledgling English colony. Fishing, hunting, timber and trade all helped the colony achieve greater stability. The late 1600’s and early 1700’s mark the Bahamas’ most famous era: the Golden Age of Piracy. The lawless city of Nassau became the world’s pirate capital as figures including Blackbeard and Calico Jack terrorized French and Spanish ships in the War of the Spanish Succession. Order was reestablished by the King in 1718, and most pirates surrendered to the authorities. The Bahamas were briefly held by the Spanish during the American War of Independence but were reclaimed by Britain as a refuge for Loyalists fleeing America. In the Civil War, Union forces blockaded Southern ports, thus preventing British supplies from reaching Rebel soldiers. As a result, the Bahamas became a vital trading port for the Confederacy. The Bahamas prospered again during the Prohibition years as Americans flocked to the islands to buy alcohol. When Prohibition was repealed in 1934, the Bahamian economy collapsed. Since independence in 1973, the Bahamas have thrived on tourism and finance. It is now one of the best tropical tourist destinations in the world. Nassau: Once Blackbeard’s “Privateers Republic,” Nassau is a vibrant city full of colorful buildings, great historical sights and wonderful scenery. It’s the most populous city in the Bahamas and is located on New Providence Island. Start your tour at the Pirates Museum. 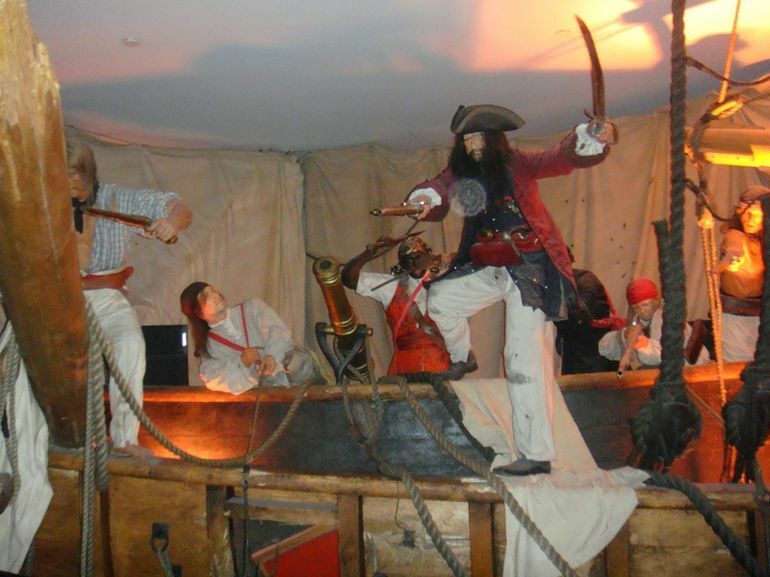 Visitors can board a replica pirate ship and get a feel for what the pirate’s life was like. If you’ve seen any Pirates of the Caribbean movies or have a general interest in pirate history, this is a must-see. Ardastra is the only zoo in the Bahamas. While it’s a bit small, the marching flamingos exhibit makes it worth your time. 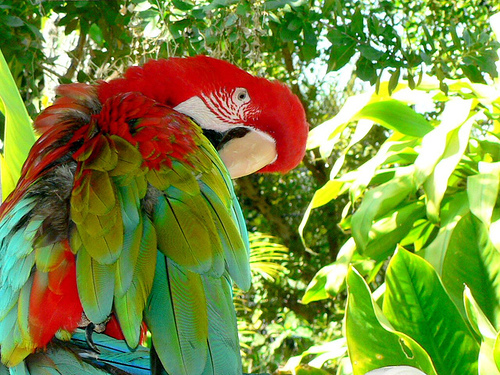 You can also feed beautiful Lori parrots and take a stroll through the well-manicured gardens. Fort Fincastle was once a British artillery station and then a lighthouse. Today, visitors can climb to the top of this stone ship-shaped fort and get a phenomenal view of Nassau and the Atlantic Ocean. 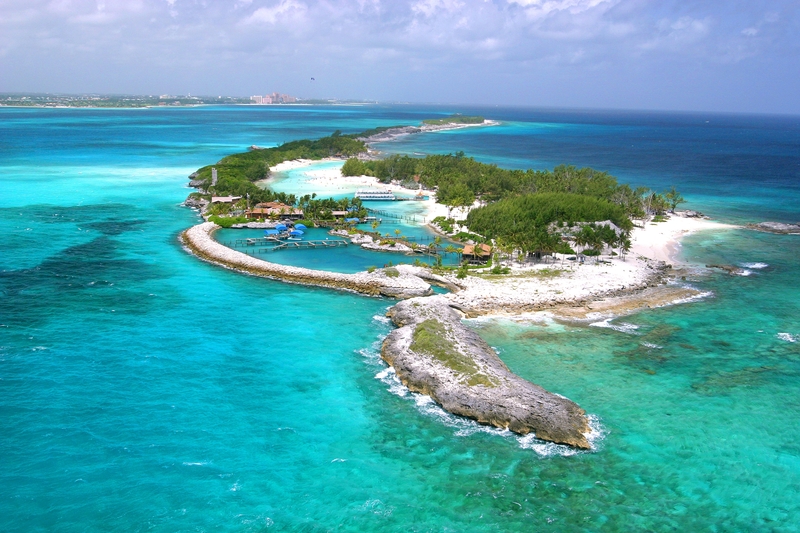 Blue Lagoon Island is just off the coast of Nassau and is one of the area’s best attractions. The island is privately owned and is home to a huge dolphin sanctuary. You can get meet a dolphin, play water sports, watch sea lions or just relax in a hammock sipping a tropical drink. For something a little more adventurous, Stuart’s Cove is one of the many Bahamian underwater exploration companies. They’ll teach you the basics of scuba diving or snorkeling and take you to the incredible coral reefs and shipwrecks that have made the Bahamas one of the diving centers of the world. If you don’t want to get wet, Stuart’s Cove has personal submarines. 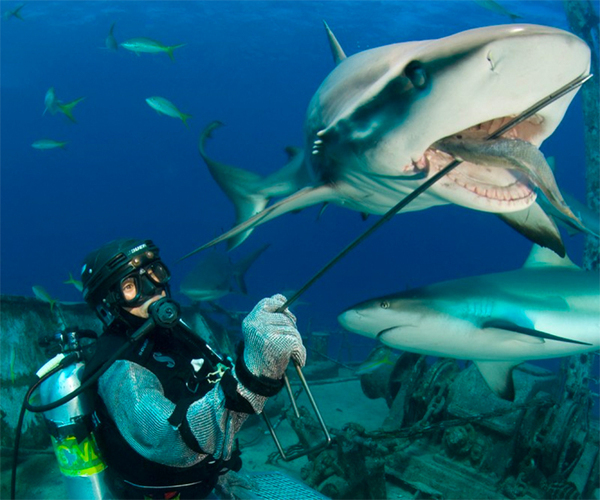 The truly brave can get in a shark cage to get up and close with the ocean’s most fearsome predators. Atlantis Resort: No trip to the Bahamas would be complete without a visit to Atlantis Resort. Located on Paradise Island, just a short drive from Nassau, Atlantis is a combination mega-resort and waterpark, and it’s almost a city unto itself. One of Atlantis’ most impressive sights is The Dig, an imagining of the underwater ruins of the lost city of Atlantis. Besides the amazing underwater architecture, the exotic wildlife includes eels, jellyfish, sharks, piranhas and venomous lionfish. If you want to actually get in the water, Atlantis has plenty of great options. Scuba diving, snorkeling in the ruins of Atlantis, shark cages, swimming with dolphins, petting stingrays – the list of fun activities is long. Both kids and adults can enjoy the gigantic, tropical-themed water park featuring a mile-long river ride, a 60 foot near-vertical drop on a water slide, and 11 beautiful, relaxing swimming pools. Don’t think that Atlantis is all about having fun in the water. For a more traditional resort experience, there’s world-class luxury shopping, a movie theater, fitness room, tennis courts, spa, concerts, casino, golf, yacht and fishing charters, and much more. Note that it is only guests who have access to Atlantis’ attractions. Grand Bahama Island: This stunning island is home to one of the Bahamas’ most unique natural wonders: the Lucayan National Park. While this park is most famous for the idyllic Gold Rock Beach, a filming site for several Pirates of the Caribbean films, what really makes Lucayan special is its extensive underwater cave system, one of the largest in the world. Several companies offer paddling tours that take you through the tranquil, sunlit caves. The island’s largest city Freeport is a tourist magnet with excellent souvenir shops and live entertainment. Xanadu and Lucaya are the most popular of Freeport’s beaches but Fortune Beach is a less crowded option. Be sure not to miss the lush, tropical paradise of the Garden of the Groves. The Garden has thick tree groves, waterfalls and an interesting limestone labyrinth. Castaway Cay: Located in the Abacos Islands is the Disney-owned Castaway Cay. Hop on the Disney Magic or Disney Dream cruise ship and head to the sparkling white sand and deep blue waters of this tropical paradise. Vacationers can snorkel, bike ride, feed stingrays, relax on the beach and more. Bimini: As the closest Bahamian island to Florida, Bimini is one of the Bahamas’ most popular tourist destinations. Bimini is renowned for its fishing, coral reefs and its association with author Ernest Hemingway. Hemingway lived on the island from 1935 to 1937 and it was in Bimini that he allegedly caught the marlin that inspired him to write The Old Man and the Sea. Bimini also has some of the Bahamas’ most interesting shipwrecks including the S.S. Sapona, a WWI-era cargo steamer built by Henry Ford, and the Piquet Rocks, the site of a huge Spanish galleon complete with cannonballs. 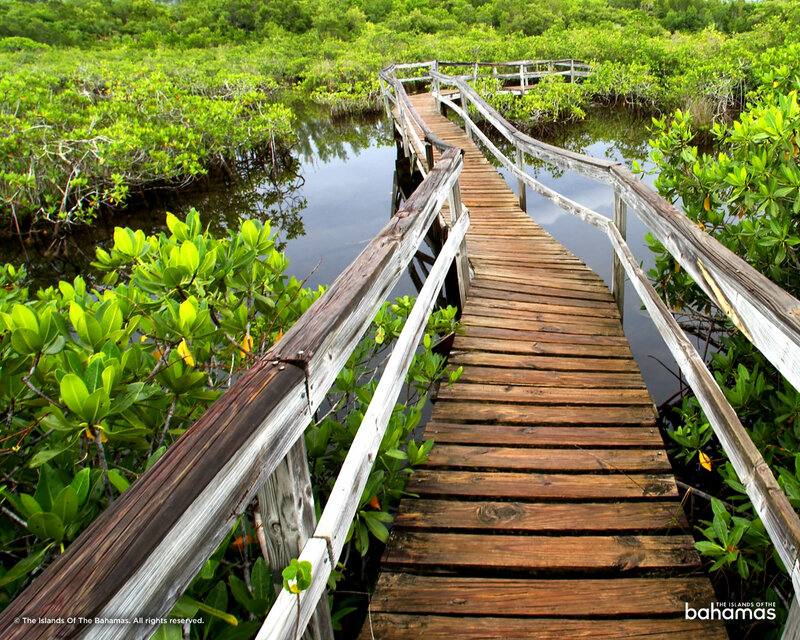 Located off the coast of Bimini is one of the world’s most enigmatic archaeological sites, the Bimini Road. Some have speculated that this underwater rock structure is the ruins of the fabled Lost City of Atlantis, but there is a debate whether this is actually a manmade structure or truly a geological feature. Several companies offer scuba diving trips to this fascinating attraction. Exuma Islands: For an off-the-beaten-path experience in the Bahamas, the Exumas are one of your best options. They’re part of the Out Islands, the islands that aren’t New Providence or Grand Bahama, and are renowned for having some of the Bahamas’ cleanest beaches and most crystal-clear water. Divers will appreciate the stunning beauty of Exuma Cays Land and Sea Park, which has reefs, blue holes, underwater caves and incredible sea life such as the rare pillar coral. The park also has scenic hiking trails and bird watching sites. Take a stroll along the dock of Compass Cay and watch nurse sharks swim through the crystal clear water. Don’t worry, they’re mostly harmless. For a bit of history, check out the Hermitage Plantation. Built by the Loyalist Ferguson family in the late 1700’s, this is the last surviving example of a cotton plantation in the Bahamas. You can see the family tombs, kitchen and slave quarters. Wild cotton still grows around the property, a reminder of its former life. The Thunderball Grotto is what the Exumas are best known for. Scenes from the James Bond films Thunderball and Never Say Never Again were filmed here in this exotic, shimmering marine cave. For kosher food and the perfect Bahamas experience, the best option is Kosherica. They provide kosher accommodations at Atlantis Resort and have dates available for Sukkos 2015, winter break 2015 and Pesach 2016. Additionally, the Super Value Supermarket at Cable Beach and Super Value on Mackey Street both carry a decent kosher selection. Most cruises to the Bahamas offer kosher food at an extra cost. Cruises to the Bahamas leave from various cities in Florida and currently start at $130 per night. If you’re in a hurry or if cruises just aren’t your thing, you can always fly to Nassau’s Lynden Pindling Airport. Flights currently start around $660 per person round trip.